How many of us have received those emails promising thousands for helping a government official or some important person solve a problem? I know I have, although I always ignore them wondering who out there actually falls for them. This book shows us who sends them, and more importantly who answers them. I Do Not Come to You by Chance tells the story of Nigeria's famous 419 email scams and centres on Kingsley, a recent engineering graduate, engaged to Ola, who believes that his education would open all the doors necessary to get a job in an oil company and provide for his family. Unfortunately, Kingsley is unable to secure a job, loses his fiance and turns to his Uncle Boniface, or Cash Daddy, to work for him in his email scam 'business'. It is an age-old morality tale – the good guy turned evil due to his circumstances. But that doesn't stop it from being a great book. I loved the characters – even the vile Cash Daddy, who actually conducted meetings while on the toilet. And I especially loved the emails. Is it wrong that after some time, when I finally accepted that Kingsley was a 419er, that I wanted him to excel in his ‘job’ and cheat unsuspecting western ‘mugus’? 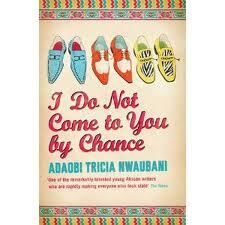 I know it’s wrong, but this book was so good, you forget that Nwaubani is writing about email scammers.